Match Me Happy’s Yorkshire Dating site is tailor made for singles who are ready to take to the realms of the internet in hope of finding their true love! Online dating is always a great idea because you’re broadening your horizons and meeting people you wouldn’t have otherwise come across, even if it’s just a new friend you meet, it’s still a positive outcome and we’ve got towns and cities from all across Yorkshire so you’re chances of finding your perfect match might be easier than you think! Online dating is great for everyone; If you’re busy and find it hard to meet new people it’s a great tool, or better still- when you take the time to date someone, you can guarantee it’s going to be a success as you’ve already built a bond with the person prior to your date so you can invest your precious time wisely! For those who are new or slightly nervous about the concept of dating, you can take comfort talking to people from the comfort of your own home, it’s a lot easier to approach strangers virtually and you can enjoy building a connection with them as your confidence grows. Yorkshire is a dating paradise! Discover some unique and memorable dates in Sheffield or chat to the friendly singles in Doncaster. The Yorkshire Dating Site is a hub of opportunity, waiting to be unlocked! It’s time to put yourself out there, there’s someone out there for everyone- you’ve just got to look! 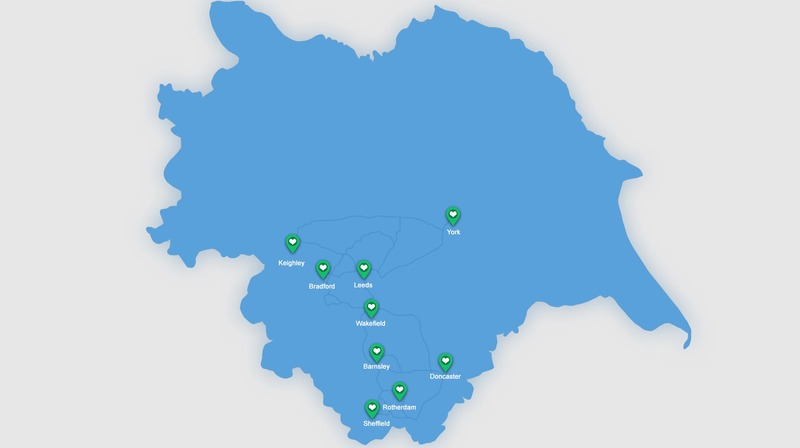 Yorkshire is a huge place and so we’ve made it easy to target the people around you, from Barnsley to Keighley, Leeds to Wakefield, you’ll find people nearby who would love to get to know you! Match Me Happy’s Yorkshire Dating Site is host to a range of singles from multiple backgrounds! Cities like Leeds and Sheffield are electric in atmosphere but it can be difficult to find a soulmate within the swarm of people! Find your special someone online and enjoy dating in these metropolis cities! It’s safe and reliable and you’ll receive support from the beginning. You’ll complete the requirements and personal preferences and have the option to include your hobbies and interests as well as a writing a bio and uploading a profile photo. Having a detailed profile could make users more interested in contacting you. Don’t be vague! We’ll also send our newest recommended members straight to your inbox. Dating is a fun and exciting way of reaching new people and by becoming a member, you can have fun with the process, send winks and enjoy the exclusive features like messaging and encounters. You’ll soon learn how easy it is to meet your soulmate once you have the right tools! Sign up is free and you can start browsing the singles in your area instantly.